Idris Kanu (left) scored for Posh reserves against Cambridge United. Peterborough United manager Grant McCann is delighted with the rapid progress of 17 year-old striker Idris Kanu. Kanu scored as Posh reserves were beaten 5-3 by Cambridge United in a friendly at the club’s training ground today (August 22). Posh striker Ricky Miller converted two penalties in the friendly against Cambridge United. The summer recruit from Aldershot Town has also impressed in his substitute appearances for the first team this season. “Idris has done brilliantly,” McCann stated. “He is still a bit behind the others in terms of fitness as he was training with the kids at Aldershot before he joined us. “But he is getting sharper by the week. I’ve been very pleased with his first-team performances from the bench and he was good in this game. “It was a great game, very end-to-end. It’s a shame to be on the wrong end of the result, but these games are mainly about fitness. Miller’s goals both arrived from the penalty spot. Both were equalisers for 1-1 and 3-3 after fouls on Kanu and Danny Lloyd. Miller also set up Kanu for a tap-in which briefly had Posh in front at 2-1. 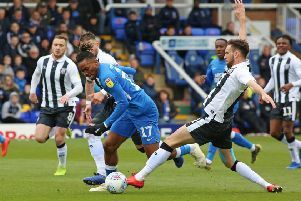 Former Posh youngster Jevani Brown scored a spectacular goal from 30 yards for a Cambridge side managed by Posh legend Mick Halsall. Posh midfielder Chris Forrester struck a post with a 25 yard strike late in the game. Posh: O’Malley, Borg, Hughes, Shephard, Kanu, Lloyd, Forrester, Penny, Trialist, Miller, Freestone.